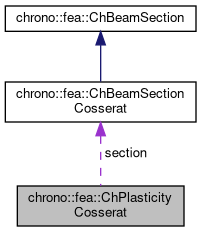 Base class for plasticity of beam sections of Cosserat type. This can be shared between multiple beams. Compute the 6x6 tangent material stiffness matrix [Km]=d/d, given actual internal data and deformation and curvature (if needed). If in plastic regime, uses elastoplastic matrix, otherwise uses elastic. This must be overridden by subclasses if an analytical solution is known (preferred for high performance), otherwise the base behaviour here is to compute [Km] by numerical differentiation calling ComputeStressWithReturnMapping() multiple times. Shortcut: set parameters at once, given the diameter of the beam assumed with circular shape. Shortcut: set parameters at once, given the y and z widths of the beam assumed with rectangular shape.